Heads up: This is a personal blog post. Nothing about benefit auctions here. Even though she knew I was a plus-size model, she was excited to suddenly see someone in print whom she recognized. In front of my own photo at a store. This one wasn’t in Paris. And maybe three years ago, my New York friend Terri Murray was attending a fashion convention in Paris, France. She was walking all over the city, and among the hundreds of boutiques there, she cruises by an Ulla Popken store. As she’s walking by the window, she looks up, and there I was – larger than life – on a poster in the window. She was happily surprised to see the image, which I find a little funny … because … well … because she herself is a model. So why do I mention these? I bought this card at Trader Joe’s. It’s designed by my friend Steve Haskamp. Without thinking about much of anything, I pulled out the first card, flipped it over to read the back, and — OMG — there’s my friend Steve Haskamp’s name as the designer! I let out a squeal because just a week ago, I wrote about Steve and his artistic endeavors. I even mentioned that he designed cards. Yet — there I was, totally caught up in everyday life — and easily delighted when I saw my friend’s name in print and his artistic work in my hands. It was my unexpected connection to a person-in-print, and I caught myself reacting in the same way as all of my friends reacted when they saw me in print. 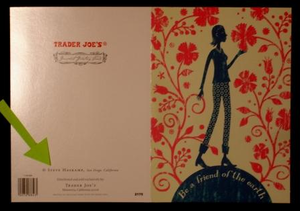 I think I am just as excited to see my card on your blog as you were to find it at Trader Joe’s!! Thanks for mentioning me here! I really enjoyed reading this posting! What a nice (and well told) story. How funny. Even today… years after first seeing Steve’s name on a piece of his work I still get that same wonderful feeling. It’s a mixture of pride, admiration, inspiration, love and deep appreciation for my brother’s incredible gifts and the journey he’s taken to make this his life’s avocation. It’s extremely gratifying to know that he’s touched yet another life with his work but more importantly who he is as a person. Thanks for posting this on your blog.